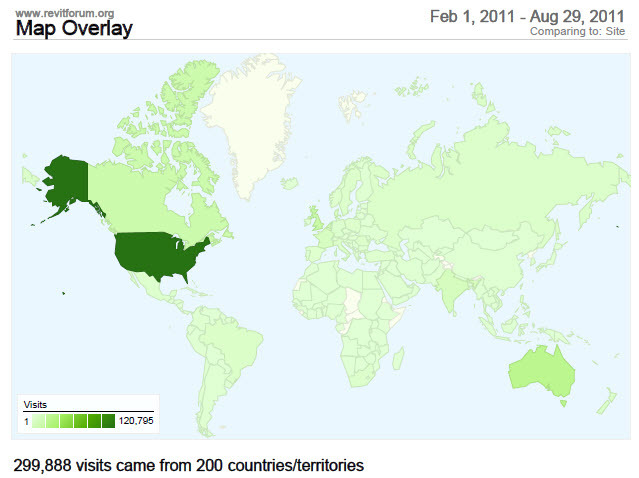 This image shows all the countries from where Revitforum.org has been visited during the last 7 months. The greener the color, the higher the number of visitors. The report says that the number of countries or territories is 200. Considering that the United Nations has 193 countries registered, a number of 200 is really impressive, especially considering that Revitforum.org has not celebrated its first anniversary yet. Even more impressive is the interest for this software itself, which was launched in April 2000 by Revit Technology Corporation, and has been part of the Autodesk family for less than ten years. Well, and probably The Vatican?